New details were revealed today surrounding the introduction of a Margaritaville Resort to the shores of Lake of the Ozarks in Osage Beach, Mo. This new lakeside retreat, the first of its kind for Margaritaville, will feature renovated guestrooms, an exterior refresh and several new dining concepts. Upon completion of a phased renovation program in spring 2019, the property will be named Margaritaville Lake Resort, Lake of the Ozarks. 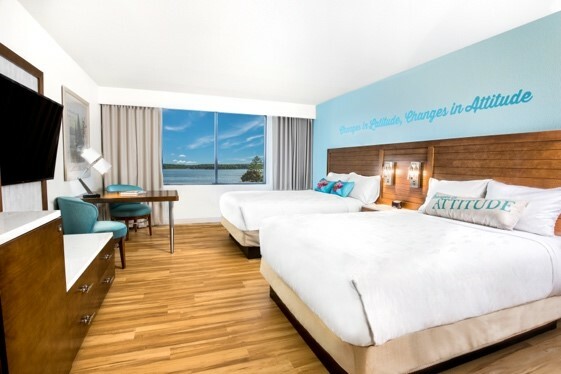 Guestrooms in the Resort Complex have been updated to feature elements of Margaritaville’s signature ‘casual-luxe’ design, such as sky-blue walls, offset by warm wood elements with bright accents. The exterior of all buildings at the Resort Complex are now a shade of warm sand, accented with white trim, to reflect the lake’s peaceful shoreline. Guests also will find enhanced activities and facilities, including a fresh new fleet of gray golf carts for The Oaks golf course and the renaming of Arrowhead Pool and Bear’s Den Arcade – now Lakeside Pool and Fin City Arcade, respectively. 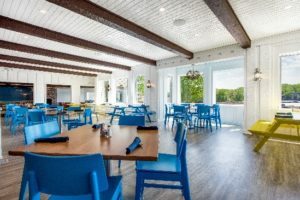 JB’s Boathouse Grill (pictured below) serves breakfast, lunch, dinner, boat drinks and more – featuring classic nautical décor with bright blues and crisp whites. Fin City Pizzeria features a cool and comfortable atmosphere and is the perfect spot for guests to grab a fresh pie. Windrose Marker 26 Lakeside Dining, a resort staple, serves exceptional seafood, steaks and more, with incredible lake views. The Tiki Hut Pool Bar, a new concept located at the resort’s Lakeside Pool, offers light fare and tropical beverages for those enjoying fun in the sun. LandShark Bar & Grill (opening spring 2019), the new flagship waterfront restaurant, features classics like fish tacos, nachos, wings, crisp salads, boat drinks and signature LandShark burgers. Final touches will be completed early next year, including updates to the lobby, marina, water park, bowling alley and more. For more information, visit www.Tan-Tar-A.com and follow Tan-Tar-A Resort at Facebook.com/TanTarAResort, Twitter @TanTarAResort and Instagram @TanTarAResort.